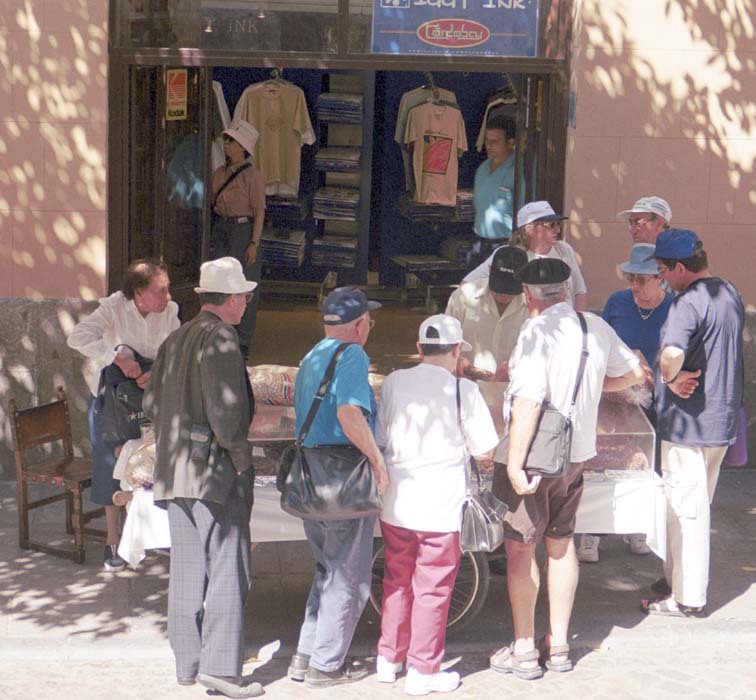 On Tuesday we took the train from Puerto to Cordoba. It was a little over an hour, by way of Sevilla. 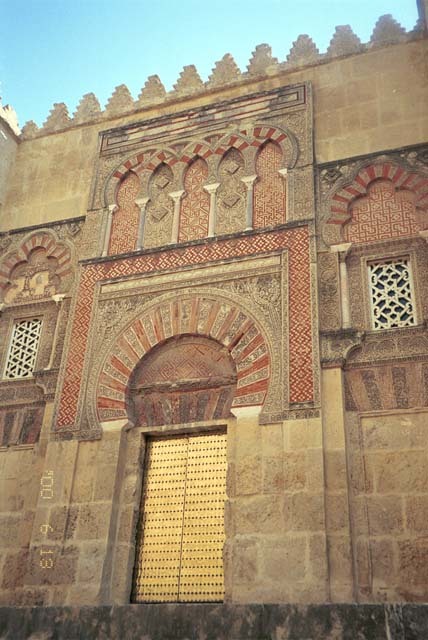 Cordoba was both the Roman and Moorish capitol of Iberia. In 1000 AD it was the largest city in Europe, a multi-cultural metropolis ruled by the Moors, with Muslims, Christans, and Jews all living together. When the Moors conquered Cordoba in the 8th century they found a Visigoth cathedral on this site. They pulled it down and built a mosque complex. The walls enclose about four acres. From the outside there is only a hint of what is to come. Notice all the closed brass doors - more on this later. Over the centuries, the Moors roofed-over and developed more and more within this complex. 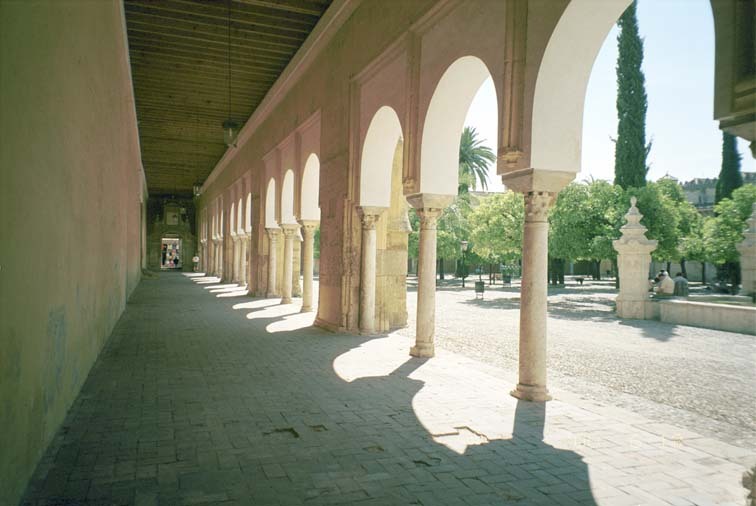 When the Christians reconquered Cordoba, instead of pulling the mosque down, they dedicated it as a church and used it for themselves. 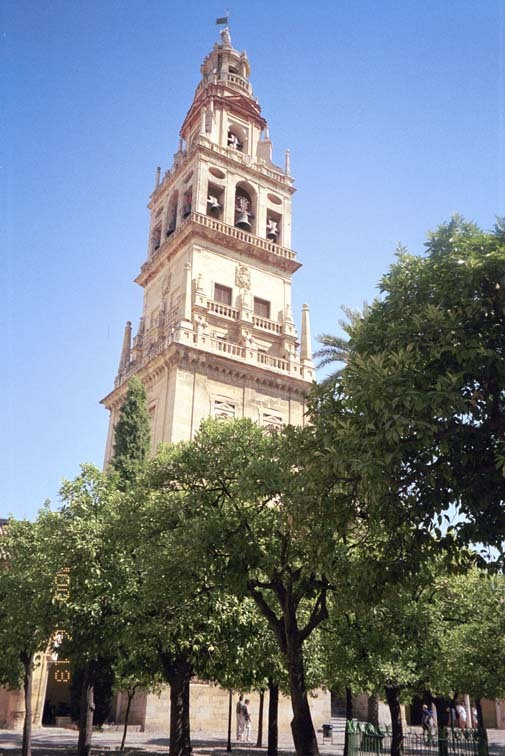 Thus it is preserved to this day, known in Spanish as La Gran Mezquita. The detail around the doorway previews the theme used throughout. 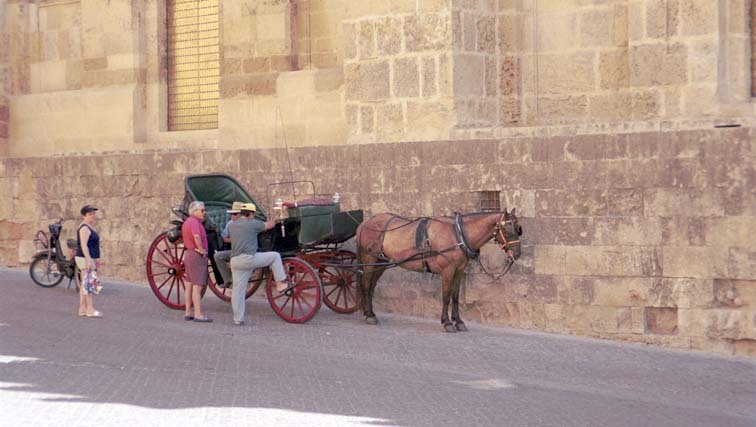 Here is a carriage you can take around Cordoba, if you would like. This food vendor was selling from his cart in the shade. This area is along the edge of the courtyard just beyond the bell tower. The orange trees in La Plaza de las Naranjas are visible through the arches. Look closely: there are ten people in this scene. 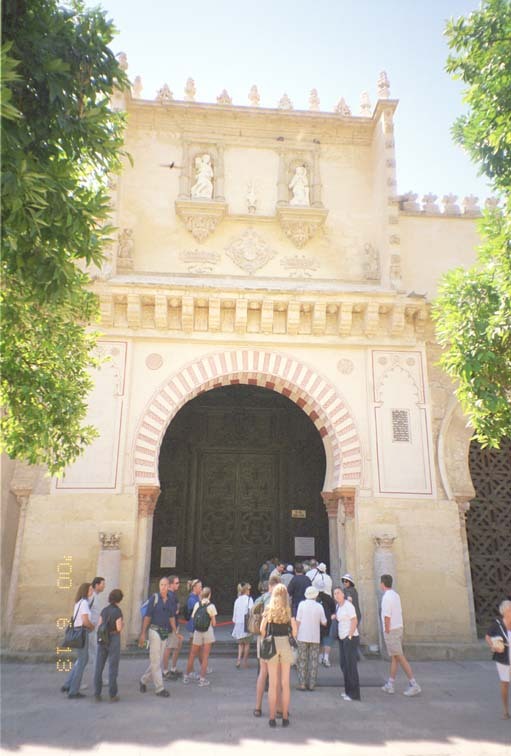 This is the tourist entrance to La Gran Mezquita. Notice how dark the entranceway is. Under the Moors, the archways were all open to the courtyard and the interior had an open, airy feel. The Christians closed almost all the archways and put chapels devoted to saints in many of them. The result is a dark interior. This archway is next to the tourist entrance. 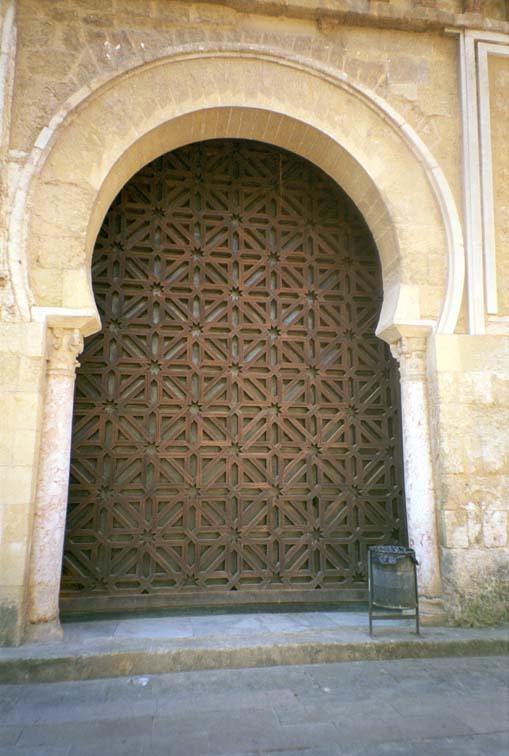 There is a brass door closed behind the woven-design wooden grate. The background on this web page is taken from the wooden lattice on this door. Related Links - Selecting will open a new browser window. National Geographic's Tale of Three Cities, including Cordoba in 1000 A.D.